When I came across the Nomiku at Engadget Expand last November, I was intrigued. 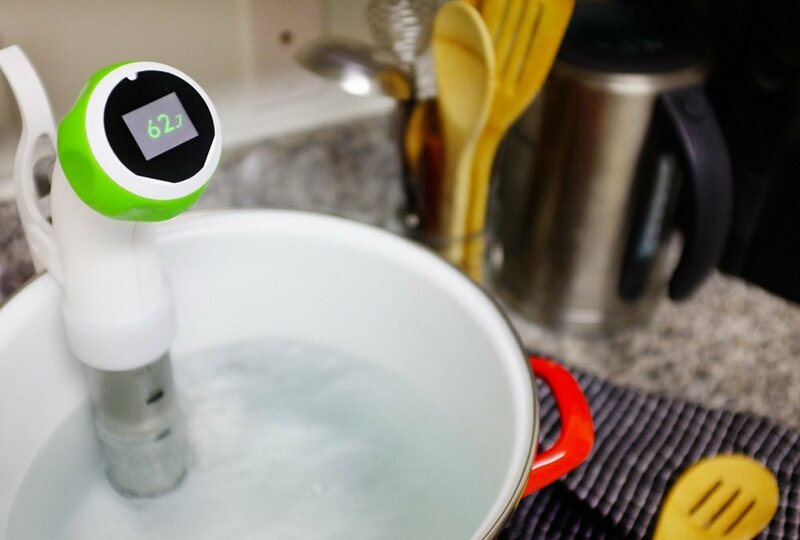 I had heard of sous vide cooking, but had never seen it for myself. As someone who almost never cooks, it was interesting to watch the food cooking before my eyes, and I knew I had to try it out. For the uninitiated, a sous vide machine works by placing a vacuum sealed bag containing food into boiling water for prolonged amounts of time to cook it evenly in its own juices within the bag. The sous vide machine precisely controls the temperature of the water and cycles it around the bag for the required cooking time. Some devices are their own water containment while others can be used with any water container (the Nomiku is of the latter type). The Nomiku is a device that has a design aesthetic on par with anything released by Apple. In my tests, I clipped it to the side of an eight gallon pot that ably contained enough water. Rather than acquire a vacuum sealer, I used a method of removing air from the bag utilizing the water in the pot to push the air out. The machine is then turned on and the food is left in for the required amount of time to cook properly. For my initial tests, I wanted to try cooking meat by itself to see how the results would be without any additional ingredients, additional cooking, or additional preparation. My first few meals created with the Nomiku were steak, chicken, and salmon. The steak came out tender and juicy, but needed to be finished in a broiler or on a grill for just a moment to get the color, crisp edges, and searing. The chicken was very juicy, but needed some additional ingredients to give it a little more flavor and a little less chewy. Of my later experiments, I found salsa to be my favorite way to add some flavor and moisture to the chicken without adding fat or anything else unhealthy. When I tried the salmon, I found it to be pink and flavorful and didn’t need much else in the way of cooking. I also tried a more complex recipe that was being featured on Nomiku’s blog when I was starting to test – Nutella and marshmallow infused scotch. I felt I was doing a disservice to my review and my sobriety if I didn’t try it out. Even the drink came out excellent, adding a chocolatey taste to the scotch with a sweet marshmallow aftertaste. The marshmallows melted quickly into the concoction, but there was also a large lump of Nutella left that was infused with scotch to eat later. Most of the features I would have liked to have seen in the Nomiku are planned for the Nomiku 2.0. The Nomiku 1.0 I tested required the user to turn it on and off manually, which means one must be home to control the device. The 2.0 is wifi enabled and can be turned on and off via an Android or iPhone app. The app will also have recipes, but until it is released, Nomiku has a website dedicated to recipes called Bag, Soak, Eat. The Nomiku is a really unique way of cooking. Everything I tried cooking with it came out amazing and led me to do more cooking in general. There’s only one thing missing from sous vide cooking, which is the smells. By cooking in a vacuum sealed bag in water, the enticing aroma of the food is missing. A small price to pay for such succulent food.